A link took me to Apple's website where every letter on the page was replaced by an A in a box. I was able to copy the page by highlighting it and then pasting it into TextEdit to see everything, so it knows what the text is. Any suggestions? Yes, this is a bad font ATSUI can't render. These have to be manually blacklisted. We will update the list for FPR2. Then you're going to have to blacklist Apple's website. Support pages (e.g., https://support.apple.com/en-us/HT204152) and Apple ID management page (i.e., https://appleid.apple.com) have this problem as well, as of about 4:00 p.m. EDT on July 10. I have to access these pages, the latter to log in and make account changes so I can access my e-mail. Banning the page is not going to help me. This is my only computer. We're crazy, but we're not that crazy. The font is blacklisted, not the page. 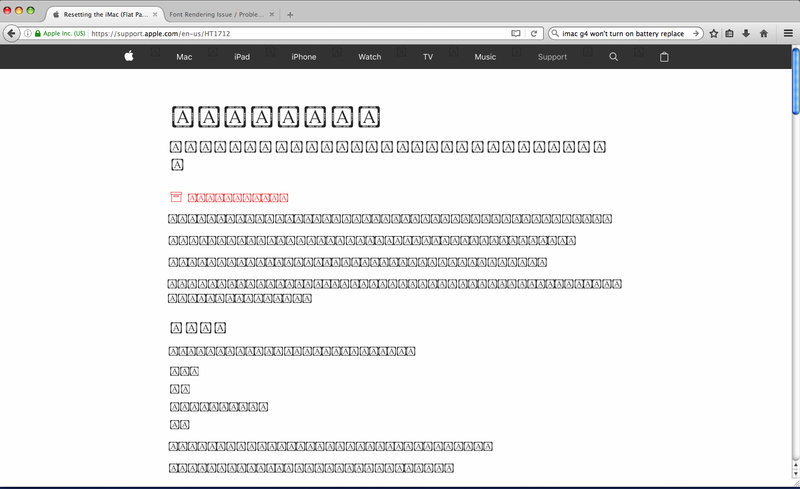 The browser will select a fallback from the fonts the page specifies or available fonts on your system. The font blacklist has been a part of TenFourFox since version 17 to work around bugs in the 10.4 SDK and ATSUI. The overlay for member sign-in does not load. I guess I'll have to wait for a new version of TenFourFox before I make the changes to my account.